A few weeks ago I spotted that Foodie Loon had been looking through my diary and Wednesday 1st October had been blocked off 8am-5pm. The date didn't mean anything to me so I wasn't sure what plans he had up his sleeve. 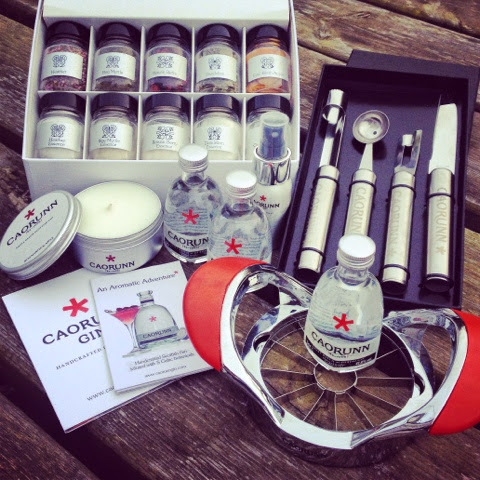 All was revealed when I was presented with a box of Caorunn Gin goodies. 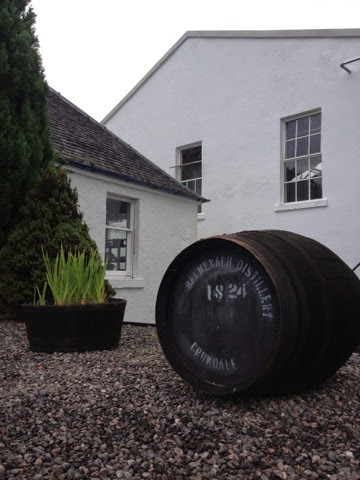 To commemorate my first year in business as a self employed Freelance Foodie he'd organised for us to visit the Balmenach Distillery in Speyside where Caorunn is made. 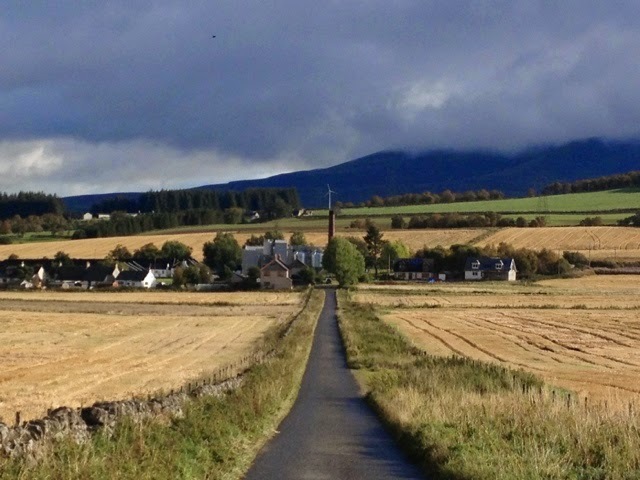 We took the scenic route from Aberdeen through Banchory, Ballater and over the Lecht. Thankfully the snow gates were open between Cockbridge and Tomintoul. 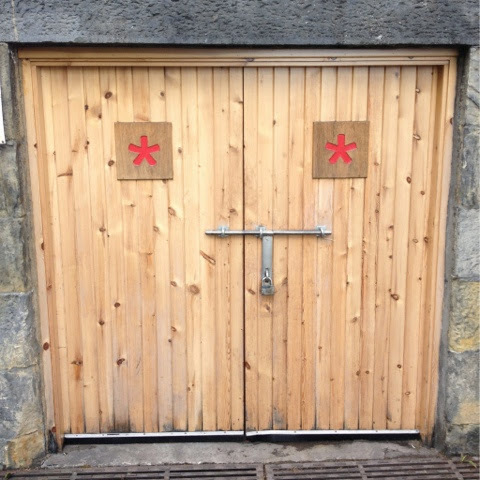 The distillery isn't open to the public and outwardly you would have no idea whats brewing in its scenic location. We were welcomed by Gin Master Simon Buley. He explained how Balmenach was one of the first distilleries in Scotland to be licensed in the production of whisky. In comparison Gin is a relative newcomer launched in August 2009. 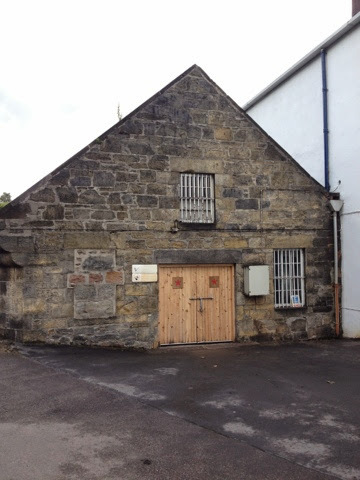 Caorunn is made in the former whisky cask filling store which has been re-purposed as the gin den. 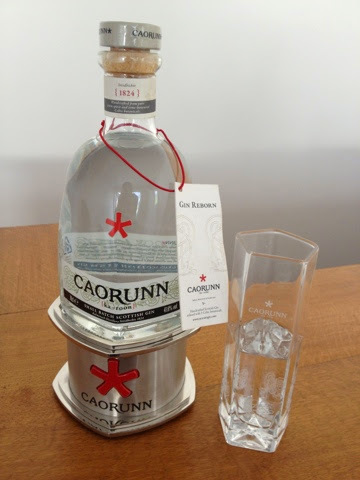 Caorunn is a small batch distilled gin infused with five Celtic botanicals. A vapor infusion method is used as opposed to steeping. This takes place in a unique Copper Berry Chamber that was made in the 1920s in the United States and originally used for the production of perfume. The round barrel like chamber contains four perforated trays onto which the 11 botanicals are spread. 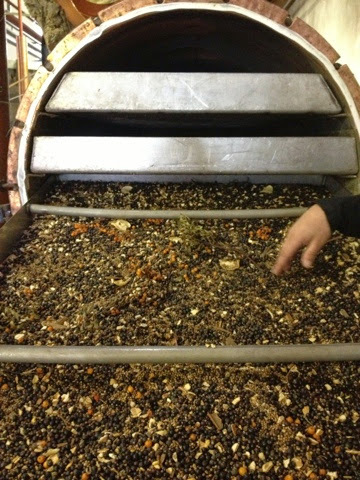 For each batch the botanicals are personally weighed by hand by Simon. When we question him on quantities he says he could tell us but then he'd have to kill us. 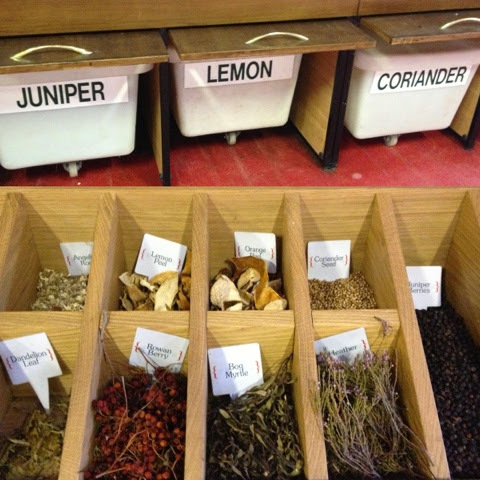 We get to have a good look, sniff and taste of the six traditional botanicals. 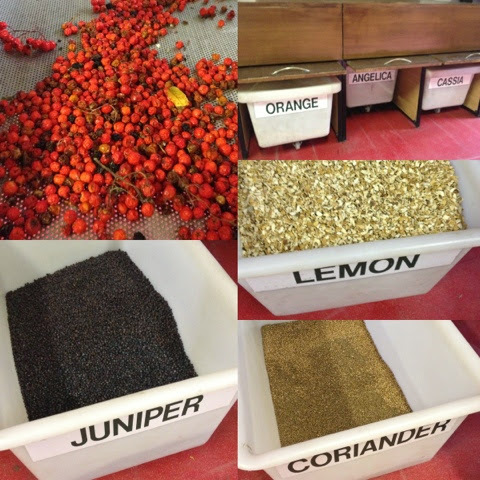 Juniper is of course the unmistakable one that makes gin, gin. It's the coriander seed that gives Caorunn much of its citrus flavour. Bite into a seed and you get an unmistakably spicy citrus as opposed to the sweet from the orange and lemon peel. Angelica root is indeed the root of the crystalised green stuff used extensively in cake decoration in the 70's and 80's whilst cassia is reminiscent of cinnamon. These are the ones that make Caorunn special. All of which can be foraged in the locality of the distillery. Rowan lends its name as well as its flavour. Caorunn - pronounced ‘ka-roon’- is the Gaelic word for Rowan Berry. As well as featuring in gin, Bog Myrtle features in midgie spray. Drink enough Caorunn and keep the wee nippy beasties at bay?! What could be more Scottish than the purple Heather which adds a floral honeyed tone. I was interested to hear the story of the Coul Blush Apple. They were raised by Sir George Mackenzie at Coul House in Contin, Ross-shire (not far from my childhood home in The Black Isle) in 1827 and are the most northerly, and hence hardy, apple variety in Scotland. Surely dandelion leaves must be one of the easiest things to forage for? Providing a hint of sharpness they are also a good source of iron. Move over Guinness. Gin is good for you. I knew the Rowan connection (coincidentally also my daughters middle name) and that the 5 star asterisk of the Caorunn logo represented the 5 Celtic botanicals. However it hadn't clicked with me that the distinctive bottle is a 5 sided pentagon shape. I also didn't know that there is a five pointed star on the base of every rowan berry. Lots of myth, superstition and magic encompass the Rowan which features heavily in folklore and witchcraft. Each batch starts with 1000 litres of neutral grain spirit which is infused through the 4 trays of the copper berry chamber. The whole process is very hands on. Gin Master Simon is there from start to finish of the 8 hour process. 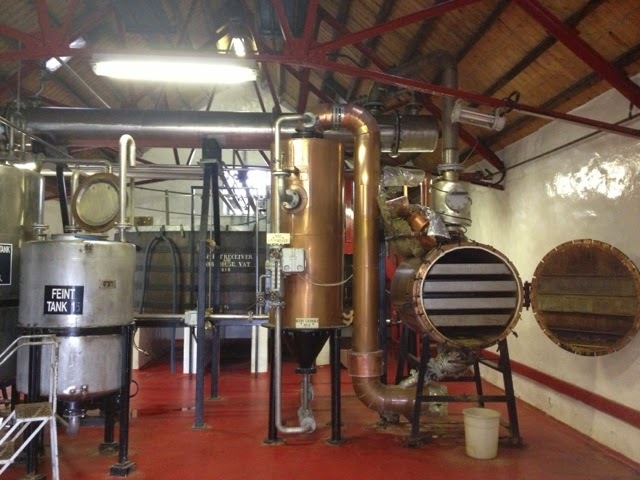 As the alcohol vapour passes through the chamber it picks up the flavour from the 11 botanicals in a long slow process. The large surface area and enclosed chamber enables every last drop of flavour to be captured. The vapour then returns to liquid and once all 1000 litres have passed through, the process begins again for a second time. 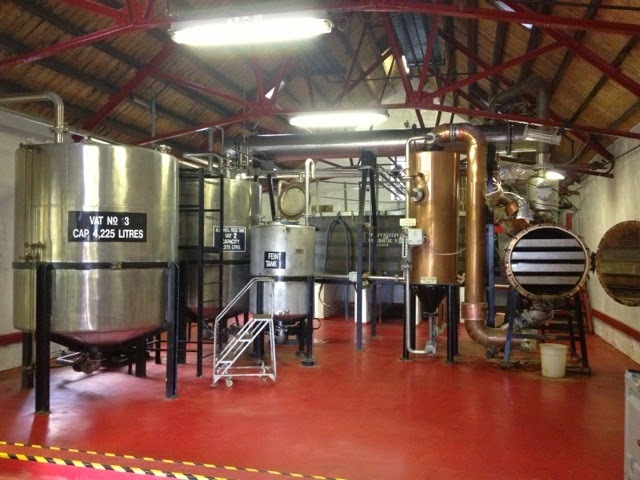 The resulting Gin is at this stage is 96% proof and has reduced in quantity to around 945 litres. So where are the missing 55 litres? 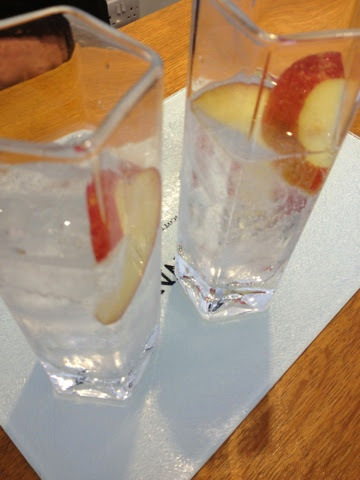 The 'anges share' of gin! The answer is in the berry chamber. At this point I wish there was scratch and sniff internet. The smell of the waste botanicals is absolutely amazing. The taste of the infused Coul Blush Apples even potently moreso. The used botanicals are then dumped. Surely this is sacrilege?! Its got to be the best smelling pot pouri ever. I swithered about speaking out of turn but plucked up the courage to ask Simon if I could take a bagfull home. Best souvenir ever. 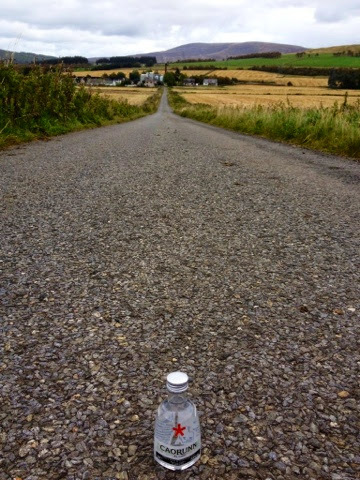 At this point in the process the Gin leaves the highlands and is transported to Caorunn HQ where it is diluted with purified Scottish water to a bottling strength of 41.8% ABV. We head to the tasting room to try it for ourselves. First we sample it at 96% as it comes out of the berry chamber. This is the strength that Simon samples it at during the production process. He is quick to point out that he's not knocking it back but merely dipping in a finger and tasting. Next comes the Caorunn perfect serve with Fentimans Tonic, Ice and a slice of red apple. Absolutely no lemon allowed. I'm no stranger to its clean, crisp and aromatically smooth taste but somehow it manages to taste even better having just learned how its made. 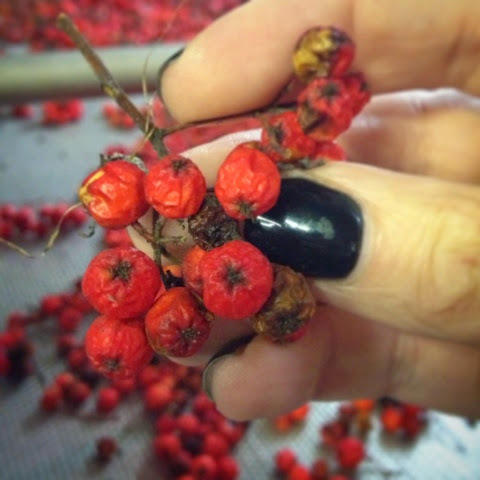 The witchcraft influence of Rowan berries perhaps? We head home with the brown paper bag of waste botanicals creating a heady scent in the car. I am slightly concerned that my designated driver may become drunk on the fumes. There's got to be a gap in the market for a Gin Magic Tree air freshener. 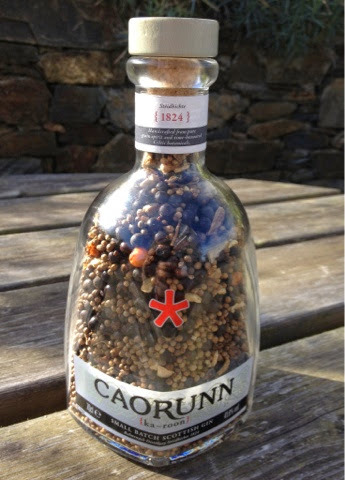 Back home I get to work creating my own Caorunn art instillation by filling an empty bottle with the 11 botanicals. But there's only 10 as I've eaten all the boozy coul blush apples! Thanks to Caorunn and in particular Gin Master Simon Buley for welcoming us to the distillery which is not open to the public. When or if it ever goes down the visitor centre and shop route I'll be first in line for manufacturing a range of Foodie Quine botanical pot pouri. How wonderful - what a way to celebrate an anniversary! The botanicals sound bewitching. 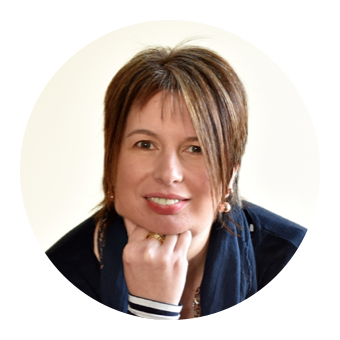 Loving the idea of 'Bewitching Botanicals" I'll have to remember that one! Absolutely the perfect way to celebrate any anniversary, looks like you had a smashing time, thanks for sharing!